Collagen is a long-chain amino acid and the most abundant protein in the body. It is composed of the individual amino acids Glycine, Proline, Hydroxyproline and Arginine and in nature is found exclusively in animal tissue, especially bones and connective tissue. It is what is responsible for giving skin elasticity, hair its strength, and connective tissue its ability to hold everything in place. 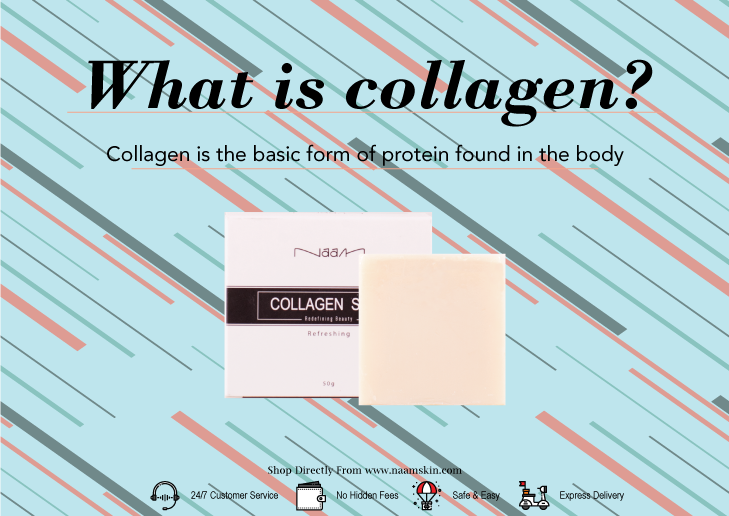 In fact, the collagen protein makes up 30% of the total protein in the body, and 70% of the protein in the skin! The body’s natural collagen production declines with age and many modern lifestyle factors (like stress, poor diet, gut health imbalances, etc.) can also decrease the body’s ability to make it. While collagen is beneficial to the entire body, it is most noticeably beneficial to the skin. This is because as a person ages, the epidermic (outer layer of skin) thins and loses elasticity in a process known as elastosis. As this happens, a person tends to show more signs of aging and acquire more wrinkles. combined benefits of Glutathione, Collagen and all-natural extracts in one beauty soap that will help in eliminating oily dull-looking skin … allowing you to redefine the beauty within.